LIVERPOOL MANAGER Jurgen Klopp says Daniel Sturridge and Divock Origi have not lost their quality despite their poor form, backing them to turn things around. Sturridge and Origi struggled to have an impact in a 1-0 win over Plymouth Argyle in the FA Cup on Wednesday, with the latter also missing a penalty. Origi is without a goal since mid-December, while Sturridge has just two in 12 Premier League games – although seven of those have been off the bench – this season. But while Klopp admits the forwards are struggling for form, but said it was understandable. “It’s not a worry,” the German told the Liverpool Echo. ”Of course for both Daniel and Divock it was not a world-class performance [against Plymouth], but that’s how it is. “They have not lost their quality. It was only this game. Of course in some of the other games they were not at their best too, but that is absolutely normal. That’s how it is. We cannot give everybody the rhythm. “Being injured, the changes we had to do, Daniel was back after injury, Divock was in and then out, so that’s how it is with human beings. Liverpool, who are third in the Premier League, play host to Swansea City on Saturday. 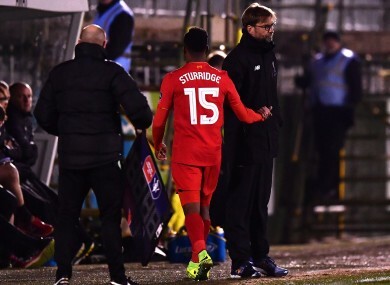 Email “'Sturridge & Origi have not lost their quality' - Klopp not worried by lack of goals”. Feedback on “'Sturridge & Origi have not lost their quality' - Klopp not worried by lack of goals”.